When you’re procrastinating, do you find yourself mindlessly wandering online? I do. Especially on social media. I feel like the aimless scrolling dulls my mind and reduces my motivation to work — but it’s a habit that’s hard to break. (Maybe it’s because social media can be genuinely addictive!). Rather than stop procrastinating altogether, I decided to test out a switch: replacing my social media habit with something else. Maybe something equally absorbing but with some benefits thrown in there as well. Read on to find out how I chose my new favorite online procrastination habit, what it was like to try it out for a full two weeks…and whether I developed any useful new skills as a result. For my social media substitute, I chose the website Freerice.com. Freerice is a website where you can take answer quiz questions on a range of topics, from English vocabulary to chemistry. You can even use it to learn Latin! Advertising on the site pays for the rice. In other words, spending more time on the website is a good thing. “The World Food Programme is a humanitarian agency of the United Nations and is 100 percent voluntary funded, so every gift counts,” says Julie Marshall, Canadian Spokesperson for WFP. So instead of scrolling through Twitter, I can spend my procrastination time doing something that actually contributes to the greater good? The goal: use Freerice.com as my preferred procrastination tool for two weeks. The fact that simply playing on Freerice results in hungry people receiving food is more than enough motivation for me to (try) to use it over social media. But could it also be an effective brain trainer? The hypothesis: As a writer, I’m always open to boost my reading speed. And with a small person who lives in my house and doesn’t care much for sleeping, I can always use some extra brain sharpness. I’m hoping that Freerice.com can improve both. The metrics: To measure my reading speed before and after, I chose The Wall Street Journal’s reading speed test. And to measure reaction time, I chose The BBC’s Sheep Dash. My baseline scores suggested that apparently I could benefit from some regular brain exercise! My average was 253.67 words/minute over 3 tests, which is, well, average. Comprehension score total was 8/9 for the 3 tests. My average reaction time was 0.4114 seconds. This puts me in the “Ambling Armadillo” category. After I took the test, Sheep Dash told me I should have a coffee, further confirming that my sleep-deprived mind was very much at the sluggish side at the moment. After capturing my scores, I was ready to take a big break from social media (most of the time, at least) — and rack up some serious time on Freerice.com. Is procrastinating better if it’s for the greater good? For the next two weeks, every time I felt the pull of brainless social media trawling, I did my best to divert to Freerice.com. I wasn’t perfect – squashing my effortless distraction with something that actually required a bit of thinking wasn’t easy! But the vast majority of the time I managed to resist turning into a social media zombie. Instead, I focused on the Freerice vocabulary test (in the hope of upping my sorry reading speed). At the end of two weeks, I’d amassed a total of 11,530 grains of rice, which averaged out to 823 grains a day. Hooray! Wait, is that a lot? What’s the value of free rice? 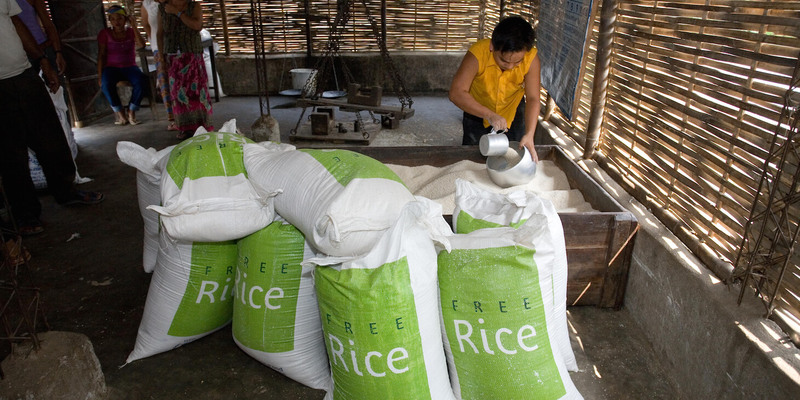 To put this into perspective, in countries where rice is a staple WFP provides about 400 grams of rice per person. There are about 48 grains of rice in a gram…so that’s about 19,200 grains of rice per person per day. It was a little disheartening to realize that after 14 days I hadn’t earned enough rice to provide one person their daily serving of rice! But Julie assured me that any contribution is worthwhile, because Freerice.com’s value actually lies in the collective effort. “At any one time, there are tens of thousands of people on the site – together, each and every one of them is making a difference. Taken alone, each individual player’s 300, 500 or 1,000 grains may not seem like much, but together they make a huge difference,” she said. So all roads really lead back to social media? Wait, don’t answer that. Let’s look at what was in it for me: did my reading speed and reaction time both improve? Did I achieve “Bobbing Bobcat” status? Sadly, it seems it would take a miracle to get my brain functioning at full capacity at present. There was some good news, though. My average reading speed improved after two weeks of Freericing: 48 words per minute faster, with the same comprehension score. While apparently I still have the reflexes of a very tired and sleep-deprived armadillo, my Sheep Dash performance was slightly less embarrassing…I shaved 0.0744 seconds off my reaction time. I understand this isn’t the most scientifically rigorous experiment. But do I feel like daily use of Freerice.com helped clear a bit of my brain fog and improve my work efficiency? Yes. Replacing social media scrolling with Freerice has also made me more mindful of my time-wasting, which is helpful when it comes to kicking an unwanted habit. So here’s what I discovered: procrastination can most certainly be productive if you find the right distraction. Will I keep using Freerice.com over Facebook when I want to procrastinate, at least most of the time? Freerice.com is win-win-win: reduced social media anti-productivity, increased brain fitness, and – most importantly – a contribution to WFP’s incredible efforts to feed the hungry. So the next time you catch yourself scrolling endlessly through your social media accounts without a sense purpose, why not switch to Freerice.com instead?